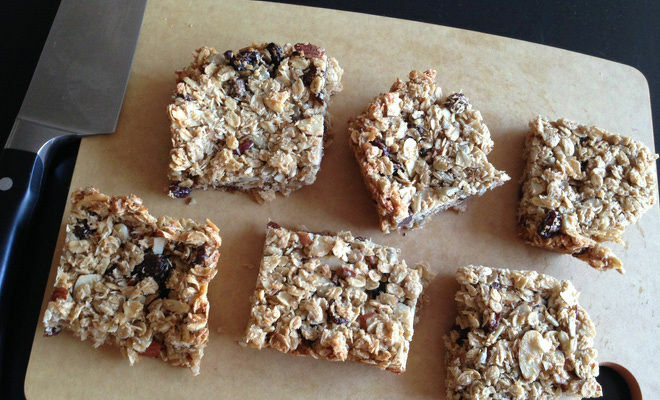 These healthy oat and raisin bars can be made quickly and taste delicious. 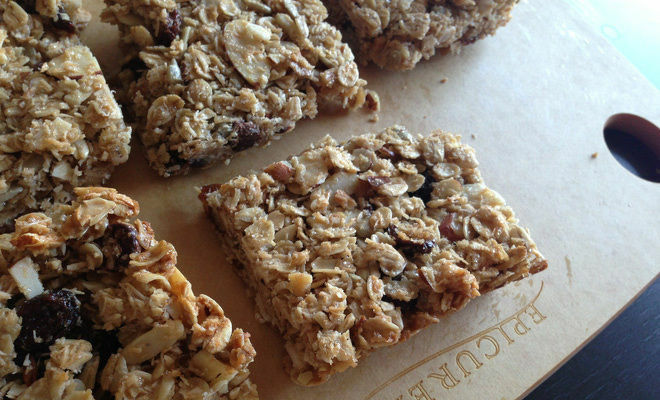 You only need few basic ingredients for making these oatmeal bars at home. 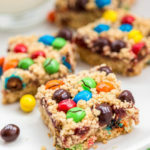 There are no tricks required here, just mix everything together, bake it and let it cool before you cut them into bars. Howe er there are few things which you should be aware of while making them. One, the bars might fall apart, honey or maple syrup helps in keeping them glued together. 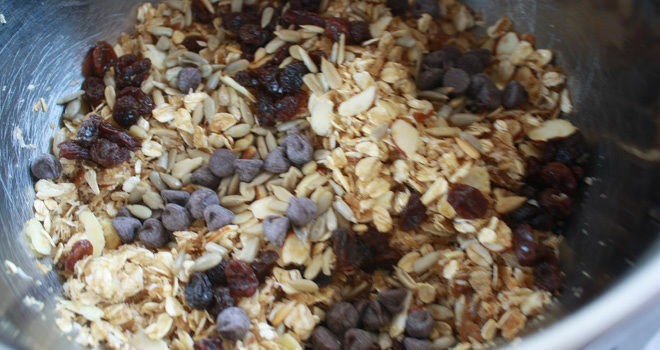 What also helps is using raisins, chocolate chips and dates. Second, you need to freeze them before cutting them into bars. I tried doing something with them while they were still warm and well they did break from places. 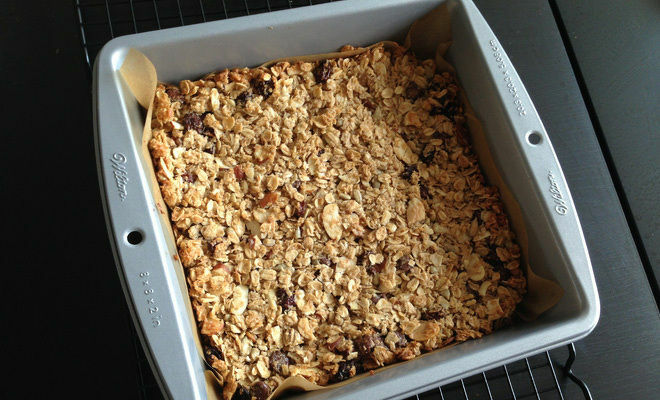 Let them cool completely, pop them into the fridge for 2 hours and then cut into squares/rectangles. Third, use a pizza cutter to slice the bars. I didn’t use one and that’s why my oatmeal bars are uneven in shape. 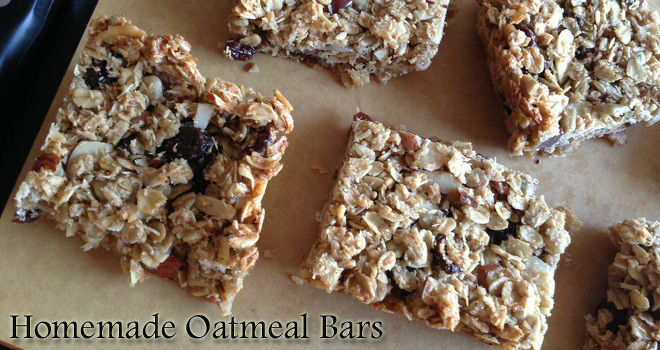 Coming to the recipe, here’s what you need for making these delicious and healthy oatmeal bars. 1. 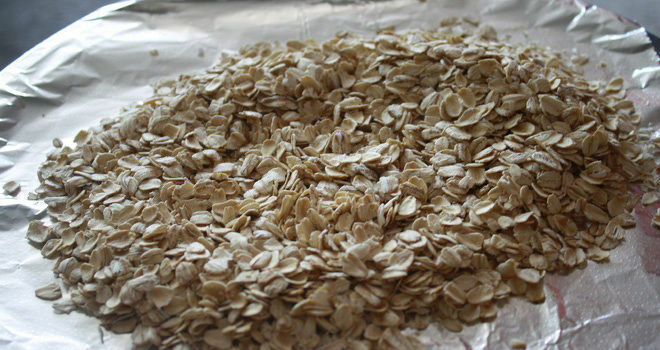 Measure the required oats and place them on a baking sheet. Preheat your oven at 350 F [180 C]. 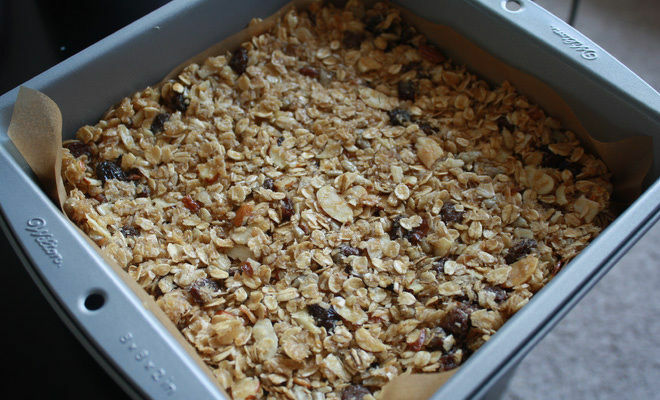 Roast the oats by placing the tray into the oven for 6-7 minutes. 2. 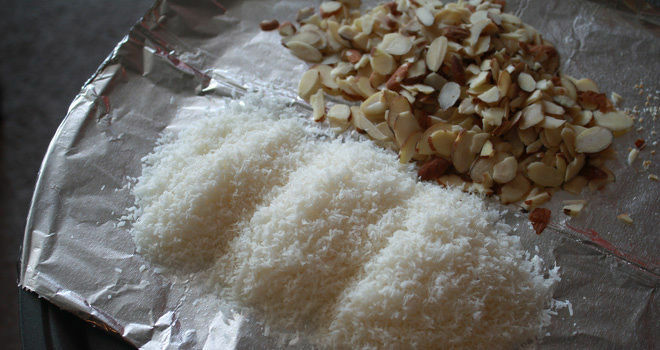 Next roast the shredded coconut and almonds. Place them into the oven at 350 F for 5 minutes. 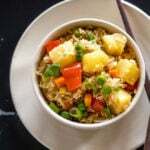 The coconut browns very quickly so be careful not to burn it. You will get a nice aroma once it’s all roasted. 3. 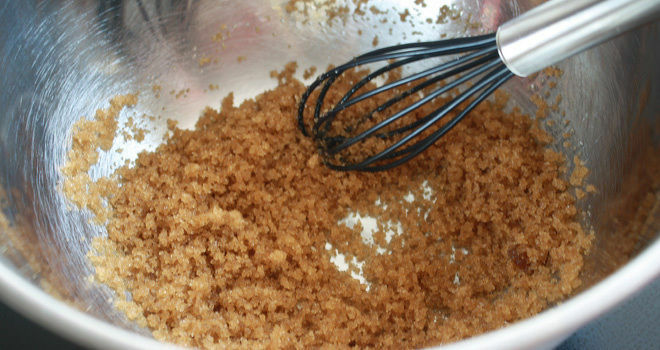 Once the roasting part is done, take oil in a mixing bowl and add the brown sugar in it. 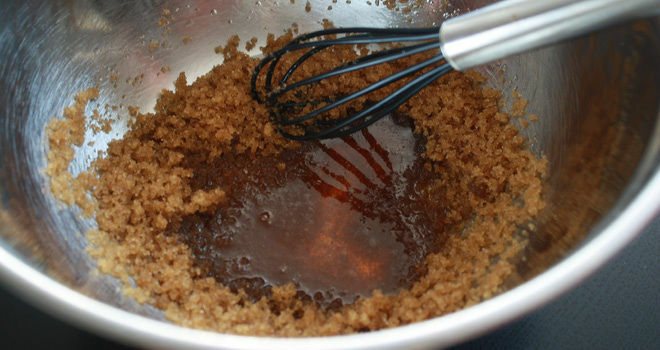 Mix the sugar well into the oil with the help of a whisk. 4. Add in the maple syrup and vanilla. You may also use honey in place of maple syrup. 5. 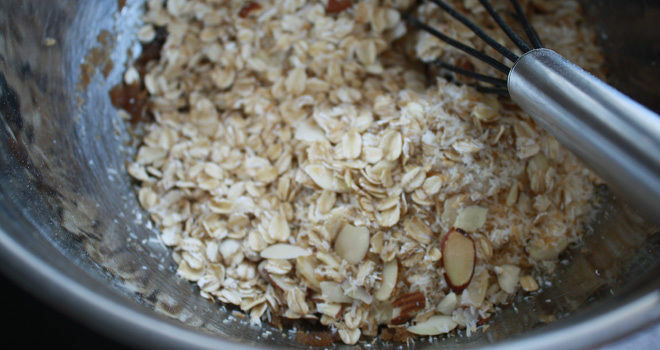 Throw in the roasted oats, coconut and almonds into the bowl. 6. The sunflower kernels and raisins go in next. 7. Next add the chocolate chips. If you love chocolate, go ahead and add more of it. Also add the cardamom powder. 8. Lastly add in the milk. Mix everything nicely, it is now ready to be baked. 9. Take a baking sheet or pan and line it with parchment paper. Make sure to use parchment paper here else the bars will not come out cleanly when done. 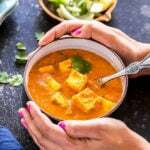 Pour the mixture into the pan and press it tightly using a spoon or spatula. 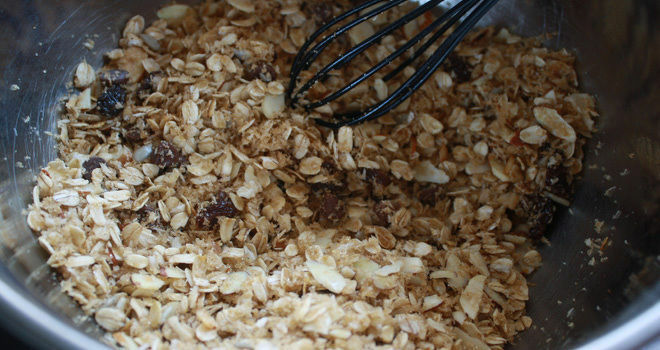 Press it for a minute or so that the granola mixture sets well. 10. Place the pan into the oven at bake for 25-30 minutes at 350 F. Let it cool down. Like I mentioned before, do not try to cut them right now. It will break down, let it cool completely. 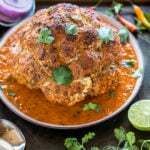 Once it has come to room temperature, cover the pan and will a food wrap and put it into the fridge for at least 2 hours. After 2 hours take out the pan and cut into squares. Use a pizza cutter for this. 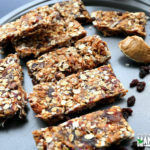 There you go your healthy homemade oatmeal bars are ready to eat. They make a great snack option. Store the bars in an airtight container. They should stay good for a week at room temperature. 1. 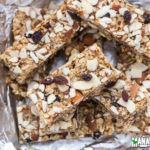 You can use any types of nuts or seeds in these oatmeal bars that you like. The combinations are endless. 2. 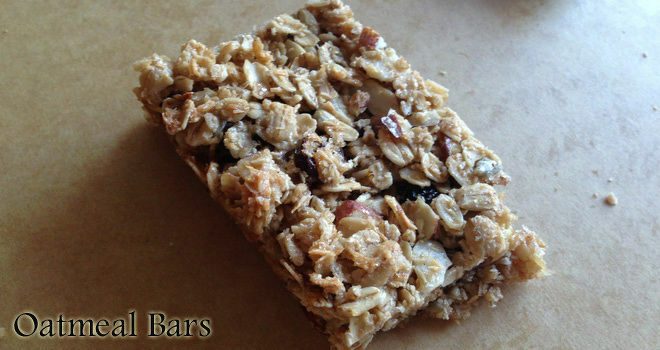 I strongly recommend adding coconut in this recipe, it add so much flavor to these bars. 3. 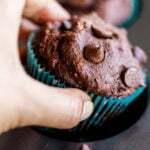 If you use dates in the recipe, cut down on the sugar. 4. 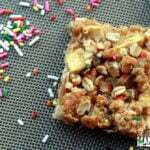 Freeze the bars to increase their shelf life. 5. 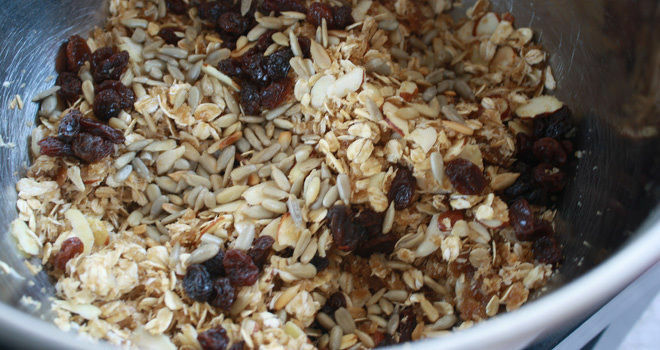 Bake longer if you want the bars to be more crunchy.